While the attached interview between the Casey Report and HFT expert Garrett from CalibratedConfidence will not reveal much unknown new to those who have been following the high frequency trading topic ever since ZH made it a mainstream issue in April of 2009, it will serve as a great foundation for all those new to the topic who are looking for an honest, unbiased introduction to what is otherwise a nebulous and complicated matter. We urge everyone who is even remotely interested in market structure, broken markets and the future of trading to read the observations presented below. High-frequency trading (HFT) – wherein computers transact thousands of times per second with incomprehensible speed – now accounts for over 60% of all trades on American exchanges. How does this sweeping market change affect retail investors? There are two very different answers to that question. Supporters claim that high-frequency traders (HFTs) are a net-positive market force because they provide liquidity and tighten bid-ask spreads. 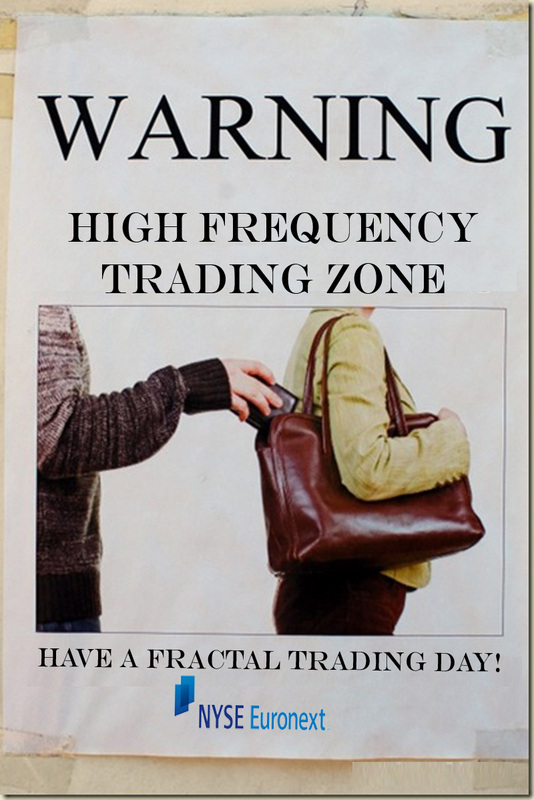 They say that high-frequency trading is rarely if ever used for nefarious purposes, and regulators make sure of it. On the other side, detractors claim that HFTs regularly manipulate unaware investors and otherwise destabilize markets. They say that HFTs are a net-negative force on the market and should be reined in. The answer surely lies somewhere in between. But which is closer to the truth? To find out, we talked to Garrett, an expert on market systems and high-frequency trading. Having experienced first-hand the problems HFTs can cause, he fits firmly in the “detractor” camp, for reasons you’ll read below. Garrett gave us excellent insight into how HFTs profit, along with tips on how to make sure they don’t profit at your expense. I found this interview highly educational, and I hope you do too. It contains the kind of inside intelligence that separates the informed from the uninformed and allows us as individual investors to understand and adapt to our changing markets. The Casey Report: Hello Garrett, and thanks for taking the time to chat with us. First, can you tell us your back-story and explain how you got into high-frequency trading and real-time trading research? GARRETT: Sure. I worked for an asset management firm as a portfolio manager’s assistant. We used traditional fundamental analysis to calculate company prices. Beginning with the July 2011 crash, our strategy no longer seemed to be working. We lost a lot of our clients’ money – nearly 40%. It was brutal. During that same time, I started to notice odd price movements on my charts, ones that I had never seen before. Prices would randomly spike in amounts and directions that made no sense. When I dug deeper, I realized the movements were too fast and too uniform to be human. Computers caused them. My bosses didn’t understand this, and didn’t want to. I couldn’t raise my concerns because of the old-school culture of the firm. But that refusal to acknowledge the new reality – that computers were increasingly driving the market – was leaving my firm at an enormous competitive disadvantage. Essentially, the market was changing, and we weren’t adapting. I began to study high-frequency trading on my own. I started by following a few professionals who were sounding the alarm, trying to alert investors that the game has changed. My favorite sources were (and are) Themis Trading and Nanex. Eventually, I narrowed my focus to study the market micro-structure – which is basically what happens to orders after you click the “buy” or “sell” button on your brokerage platform. That’s where all the action is, and it’s where you can see exactly what the HFTs are doing. I came to the conclusion that, because of HFTs, our markets are broken and fragmented. I left my old firm in mid-December, took my own money and started running my own shop, based on this premise. My strategy uses software to exploit the dislocations caused by HFT. TCR: What made you think that high-frequency trading was behind those strange price movements you were seeing? GARRETT: For one, the movement didn’t look like anything I’d seen in the past. It didn’t match human action. It was too fast, too consistent. Anomalies would randomly pop up on my screen. A particular stock would drop 10% in one second, then run right back up a second later. I asked colleagues what these movements were and where they were coming from, but no one had an answer. Even the shortest-term charts, in which every data point represents one second and the data is extremely granular (or so I thought) didn’t yield any answers. Eventually, through my own research, I realized that there was something more going on inside these one-second data points – something you can’t see on a standard chart. That’s where the HFTs operate – in milliseconds. TCR: So you’ve made a career of exploiting the dislocations caused by HFTs. What’s your answer to the question on everyone’s mind: does high-frequency trading affect the average retail investor? GARRETT: Absolutely, although the impact varies based on what type of investor you are. For a shortterm trader, someone who makes many trades per month, the effects are huge. I think the best way to understand HFT’s impact on you is to understand its advantages over you. There are three major ones. One, HFTs have better access to the market. They have what we call direct access, which means they don’t have to go through a broker to execute their trades. When you place an order with, say, Scottrade, Scottrade will choose which exchange the order goes to, and they’re going to execute the order where it’s best for them. They’re going to buy it at the best price they can and then sell it to you. HFTs, on the other hand, can choose the exchange that they want to trade on. They can look at all the prices for a given stock on all of the exchanges and make their own decision, rather than having a broker make it for them. Two, HFTs obviously have a major speed advantage over other investors. They glean this advantage in many ways: by putting their servers right next to the exchanges’ servers, by using very sophisticated equipment, and also simply by virtue of programming a computer to act on pre-set instructions, which it can do much, much faster than a human ever could. Third, the best HFTs have an impeccable understanding of the market micro-structure: what happens after you submit an order to your broker? Where does your order go, how is it executed, how are orders prioritized? HFTs are experts on this, but very few retail investors even understand the basics. TCR: It sounds like the average investor is seriously outgunned. But what about a retail investor with a longer timeframe who only makes 1-2 trades a month? Does he need to worry about high-frequency trading? GARRETT: HFT affects all investors to an extent, because stocks are now priced differently than in the past. The market used to consist mostly of investors analyzing cash flows and balance sheets, trying to calculate a company’s fair value. HFTs, on the other hand, react to movements in stock prices alone. That is not necessarily a bad thing, but since HFTs are responsible for two-thirds of the trading volume, we have the strange situation where they can set the price based on what they perceive others’ perceptions to be. Also, even long-term investors have to enter and exit their trades at some point, which is where the most risk is. You might enter the trade when the computers are doing their trending movements and inadvertently buy at a peak. TCR: What are trending movements? GARRETT: Trending movements are when an HFT deliberately moves a stock price up or down for its own benefit. For example, a computer can submit an overwhelming number of sell orders, knock the price of a stock down a few percentage points, then buy the stock back cheaply. TCR: That sounds like overt manipulation. GARRETT: It is, which is why investors need to understand how to protect themselves. One of the most important tips I can give you is to never enter stop-losses into the market. There are algos designed to sniff out stop-losses and manipulate them against you. I’ve seen this many times: prices drop 2-4%, clear out stop-losses, then run up for substantial profits. So the poor retail investor gets his stop-loss tripped and sells on the cheap to an HFT, whereas the HFT buys cheap and profits once the price ramps back up. TCR: Do HFTs target smaller or illiquid stocks because their prices are easier to move? GARRETT: Sometimes, but I wouldn’t make that generalization. Counterintuitively, many HFTs target the most liquid stocks. TCR: So what are some other ways that HFT shops make money? GARRETT: There are many different strategies. Some take advantage of rebates, which are financial incentives the exchanges offer for being a market-maker. Here’s where I should clarify that not all HFTs are bad. I’m very sour on HFTs in general because I’ve seen the havoc they can wreak, but there are good ones. Market-makers increase liquidity and make the markets more efficient. That’s great. There are good HFTs. Some HFTs try to read and process the news quicker than everyone else. There are algorithms designed to read newspaper headlines, search for key words and execute trades based on what they read, all in seconds or less. I wouldn’t say this is particularly nefarious, because the HFTs in this case are just doing what humans do – trading the news – but faster. That said, it can create problems. Awhile back, there was an errant news release about Boeing going bankrupt, and the HFTs started selling because they saw the keywords “bankruptcy” and “Boeing.” The story turned out to be an error. In that situation, most human traders would pause and think, “Wait a minute, I’ve never heard a thing about Boeing going bankrupt. What’s going on here?” But the computers don’t think. They just execute their instructions, and in this case, it caused a crash. Then there are the manipulative algorithms, the ones that prey on other investors. TCR: Can you give us an example? GARRETT: Sure. Many HFTs will make near-simultaneous trades on different exchanges and profit because of the delay in one of the exchanges. An example will help me explain: let’s use the NASDAQ and EDGE exchanges, and say that ABC stock is trading at $1.00. The HFT will send a bunch of quotes (offers) to NASDAQ and EDGE, trying to sell ABC stock at $1.01. Once the NASDAQ order is accepted, the HFT can simultaneously cancel the $1.01 sell order on the EDGE exchange and replace it with a buy order at the original price of $1.00. EDGE immediately accepts that $1.00 order, because its system has not caught up to the new price of $1.01, and the HFT’s net position becomes zero. This is possible because of latency, which is jargon for delay in the system. The net result is, the HFT captures a $0.01 arbitrage. By scalping this tiny amount from many trades, the profits add up quickly. A second example: HFTs can model other traders’ behavior. When someone trades through Scottrade or Interactive Brokers, their order has a unique number attached to it – the same number every time a client places an order. This number is bundled with all relevant trade information (time, price, etc.) and sold as an encrypted “enhanced data feed.” An HFT can then use those past results to predict the trader’s behavior. TCR: So HFTs try to predict what you’re going to do before you do it. Do the brokers admit to selling this information? Can traders opt out? GARRETT: This data is standard and available to anyone who wants to buy it, so it’s not that HFTs are purchasing illegal information. But the data set is huge and is only of practical use to players with very fast and powerful computers – meaning HFTs. And yes, most brokers I have encountered will allow you to opt out of having your unique number attached to your information. To be clear, I’m not saying HFTs track your individual account and literally jump in front of you right before you trade. But they do use this information on the aggregate to model traders’ behavior. So an HFT could have a very good idea of when traders on, say, E*TRADE’s book will enter into a certain transaction. TCR: Many defenders of HFT claim that it is a net-positive force in the market because it provides much-needed liquidity and tightens the spread between bid and ask. Are those claims true? GARRETT: As I said earlier, there are many different HFTs that do many different things. But in my experience, in the aggregate, both of those claims are false. High-frequency trading will reduce liquidity when we need it most, and will flood the system with nonsense at other times. Case in point, computers regularly withdraw liquidity just before news releases. Oil is a great example. The other day, there was a status report scheduled at 10:30, and around 10:28-10:29, the buy orders on USO (United States Oil Fund, an ETF that aims to track oil) dried up. That doesn’t happen with human traders. So anyone who wants to get out of USO before the news release is out of luck; they can either take a bad price or wait until liquidity comes back. Contrast that with the end of most trading days, when HFTs are unwinding their positions; I actually turn my platforms off for the last 10 minutes of the day because the action is confusing and useless. Sure, there’s plenty of liquidity as the HFTs unwind, but the action is just nonsensical. There’s no new information being introduced, no price discovery. It’s just scalping. The whole liquidity argument is just a justification. On net, HFTs hurt liquidity more than they help. I also don’t buy the argument that HFTs keep the bid-and-ask spread tight. I’ve seen algorithms that quote as far away from the NBBO as they are legally allowed to. TCR: Can you expand on that? GARRETT: SEC rules say traders can quote up to 8% from what the National Best Bid and Offer is, and they’re allowed to “drift” another 1.5%. So legally, traders can trade 9.5% above or below the NBBO. Well, there are algos that probe the market, starting by submitting an order close to the NBBO, then working out to the fringes. These orders only last for milliseconds – they are not intended to be hit, only to sniff out other traders’ orders. So the algo works its way out, trying to get a bite on a price further away from the NBBO, and thus more favorable to them. That is not a recipe for a tight spread. Now, the spread might look tight on your screen, but when you actually go to fill an order, you won’t get it, because the order has already been withdrawn. TCR: So are the quotes on Google Finance or Yahoo Finance reliable? GARRETT: They are reliable enough to use as a broad snapshot. But I would not trade on them. TCR: What markets are least affected by HFT? GARRETT: I don’t know the answer to that. I see HFT the most in equities, but that’s just because I trade equities. It’s also prevalent in futures and Forex. Within equities, HFTs tend to focus heavily on ETFs. The manipulation is far less in most individual stocks. TCR: Good to know. What long-term effects do you see as a result of HFT? GARRETT: I think the biggest issue is the erosion of trust. The markets are becoming so difficult to understand, and there are so many predators, that I think people will start to withdraw and place their money elsewhere. When investors start to realize (a) they don’t know enough about the market, and (b) the learning curve is so steep as to be almost unnavigable for someone with a full-time job, they’ll start to take their money elsewhere. Instead of the stock market, why not go to lendingclub.com? Then they can at least invest money with someone in their community and actually know what’s happening with their capital. Not to mention, it will probably get them a better return. This is a little off topic, but dark pools are another example of shady market practices. Dark pools are arrangements between large institutions to trade blocks of shares among themselves. The problem is, these trades can only be seen by the participants – you and I can’t see them. They occur outside the market. Themis Trading did a white paper called the Phantom Indexes, and they found that only 30% of all traded assets are traded on visible exchanges. Think about that: it means that indexes – like the Dow and S&P 500 – are being calculated with only 30% of actual volume. The majority of trades – 70% – occurs in the dark and is not factored into the indices. It’s a little bizarre if you ask me. I don’t understand why that’s allowed. But it’s another example of market trust being whittled away. It won’t be easy to earn it back. TCR: So you think the average investor will begin to shun the stock market? GARRETT: Yes, but I also think it’s possible that companies like PIMCO and BlackRock create their own exchanges and compete to make things fairer for their clients. That would be a viable alternative to our national exchanges, which are losing credibility fast. The federal exchanges have sold their character. Take co-location, for example, which is when HFTs put their servers as close as possible to the exchange to gain a speed advantage. I understand that NASDAQ wants to make money by selling these spots. But not everyone can be located directly next to the exchange. So Goldman buys a co-located spot for millions of dollars, which is great for them, but not so much for everyone else. Once again, the little guy gets bilked. TCR: Do you think there will be regulatory responses? Might the government ban HFT? GARRETT: I don’t see how. The quicker players will always have an advantage. There will always be traders located closer to the exchanges than others. But there are some steps that would help. One proposal that I like is to mark the orders that are designed to last for 250 milliseconds or less – the ones that are designed never to be filled. That way, when I see an order on my screen, I’ll know if it’s a legitimate order or just a computer trying to accomplish who knows what. The thing is, the SEC already has rules against placing orders not intended to be filled. Obviously, it doesn’t enforce them very well. I think anything that would slow down the market a bit would help. That would bring more humans back as a percentage of traders, which is a good thing. TCR: What about a transaction tax? GARRETT: That sounds like a sad excuse to raise revenue. It’s not going to deter the big guys with the deep pockets. Once again, it would end up hurting the little guys, who already pay much higher transaction costs. As I’m sure you and your readers are well aware, raising the cost of doing something doesn’t usually have the intended effect. The government has tried to make it more expensive for people to get DWIs, guns and drugs. None of it has worked. If anything, a transaction tax will hurt the marginal players. The big, deep-pocketed institutions would be fine with a tax. They might even welcome it. Remember, it’s all about speed, and you’re not going to fill that gap by taxing people. You’re only going to fill it by controlling the way information is streamed. It needs to be slowed down. TCR: Before we wrap up, can we recap and summarize how HFT affects the individual investor and what he/she can do about it? From our conversation, I count three broad types of manipulation. The first occurs during the transaction, when you’re buying or selling a stock. For example, an algo could use your stop-loss against you. GARRETT: Yes. Keep stop-losses in your head, not entered into the market. Also, we didn’t talk about this, and it should be obvious, but I’ll say it anyway: don’t place market orders unless you want to get shammed. If you place an order and see the price is $15.60 on your screen, your order can be rerouted, filled on a different exchange for, say, $15.65, and you just donated 5 cents a share to an HFT. TCR: We’ve always advised our readers to use limit orders, even before HFT. Now it’s doubly important. The second major impact is that HFT actually misprices stocks, meaning market prices are different than they would otherwise be in the absence of computers. GARRETT: Exactly. Fundamental investors used to dominate the market. They would buy and sell based on companies’ results. Today, HFTs outnumber humans in trade volume and thus are a stronger force on prices. HFTs buy and sell based on what they perceive others’ perceptions to be, as quirky as that sounds. So instead of analyzing revenue and expenses, computers analyze how other market participants act, and trade accordingly. TCR: It seems that normal investors can counteract this by investing for the long term. HFTs create a lot of noise, trying to guess what other traders will do. But ultimately, if a company is profiting, its stock will do well. GARRETT: Precisely. You don’t want to get into a trading battle with them. But if you have a long-time horizon, fundamental investing can still work. TCR: Third, computers manipulate stock prices up and down, using the movement to their advantage. This seems to be the most nefarious and overtly manipulative. Is there any way to counteract it? GARRETT: You can mitigate this risk by being patient with your orders. If you enter a limit order and it isn’t hit in the first hour, don’t impatiently move it. Stand your ground. That way, you can dictate the price you take, even in the midst of all the HFT noise. Also, HFTs love to manipulate ETFs, much more so than individual stocks. So that’s something to keep in mind. GARRETT: I do want to add one more thing: talking to you about this actually hurts my trading system in the long run, but truthfully, my strategy of exploiting dislocations shouldn’t exist. For all I know, I’m taking money from my parents’ retirement fund because their financial advisor doesn’t understand what he’s doing. I want my kid to be able to invest legitimately when he’s older. Pillaging unsophisticated investors is bad for everyone in the long run, so I want this information out in the open. TCR: Well, this has been a very educational discussion, so mission accomplished. Thank you very much for speaking with us today.